At this week's research seminar - the first of the semester - David Herd from the University of Kent (author, most recently, of Enthusiast! 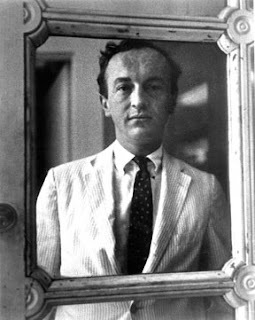 : Essays on Modern American Literature (2007)) will be talking about: "Stepping Out with Frank O'Hara." Monday February 2, 5pm, A2.51. All welcome. 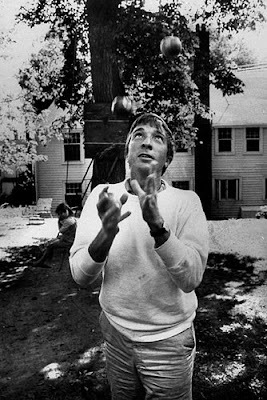 John Updike died yesterday, and the death of one of America's greatest novelists has prompted a variety of responses. A number of fellow writers react to his passing in the Guardian, whilst John Irving explains what he'll miss about Updike for Slate. The New Yorker, meanwhile, has devoted a whole section of its website to Remembering Updike, and you can listen to a selection of interviews with him thanks to NPR. If you're not sure what all the fuss is about, then the New York Times gives you a sampling of his prose and William Pritchard (for boston.com) and Deirdre Donahue (for USA Today) give you their pick of the best ways into Updike. Above, President Obama's first weekly address, released through the White House's own youtube channel. A sign of things to come? It seems like it. Throughout the last few months, Obama and his team have already demonstrated a clear commitment to the use of new technologies, and there's no sign of that stopping now. From Obama's own much-touted Blackberry fixation to the disappointment of Obama's staff at the arcane state of technology in the White House through to the immediate redesign of the White House website, this is destined to be a presidency that plays itself out in the Web 2.0 world. You can read more about the ways in which Obama is likely to use web technology in a guest spot by techcrunch.com for the Washington Post. After what has been one of the closest and most fiercely contested Senate races in recent history, Democratic candidate Al Franken was declared the winner of the Minnesota Senate race on January 5th. After the original count in November, incumbent Republican Senator Norm Coleman appeared to have won by 215 votes – a percentage of just 0.008% of the almost 2.9 million votes cast. State law requires that in cases where the margin of victory is less than 0.5% of the vote, a state-wide recount is required. The manual recount began on 19th November, with representatives of Franken and Coleman present to observe the examining of each one of the 2.9 million votes and with challenged ballots sent to the independent Canvassing Board. 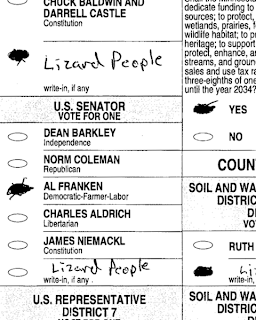 After several weeks of re-examination, ballot challenges from both campaigns (including the much-discussed ‘Lizard People’ write-in (see left)) and the acceptance of many previously-rejected absentee ballots, Franken was shown to have a lead of 225 votes, a result certified by the Minnesota State Canvassing Board on 5th January. The change in fortune was owed partly to successful ballot challenges and the fact that those manually recounting the ballots could detect voter intent where electronic counting machines could not. However, because state law requires a waiting period of seven days before the Canvassing Board can issue an election certificate, Coleman’s lawyers had the chance to file a contested election lawsuit. This means that when Coleman’s term came to an end on 3rd January, Minnesota was left with just one Senator and the certificate of election cannot be issued to Franken until Coleman’s election contest has been resolved. A three judge panel met this week to consider whether, as the Franken team suggests, the case should be thrown out before it reaches trial. If they choose to begin a trial, Minnesota's second Senate seat could be empty for months to come, whilst the scandal surrounding Blagojevich’s appointment to fill Obama’s former Illinois seat has left a second Senate seat unfilled. You can catch up with the story so far on the Caucus, Salon, the New York Times, and Slate. And you can preview the ins and outs of the trial thanks to MinnPost.com. Willa Cather declared in 1922 that the world had split in two; My Ántonia, Cather’s elegy to the Nebraskan prairies of her childhood, evokes the memories of just what had been lost to history. [T]he red of the grass made all of the great prairie the color of wine-stains. Narrator Jim Burden’s unadorned metaphor establishes the deeply personal connection that Willa Cather’s characters share with the American landscape. My Ántonia offers a fictionalized account of Cather’s own childhood experiences in late nineteenth-century frontier America, and the novel is shot through with a powerful feeling of nostalgia – what James E. Miller refers to as “that quality of evoked feeling which penetrates the pages of the book” (“A Frontier Drama of Time,” 52). The very title prepares us for this: My Ántonia does not attempt an objective account of Ántonia Shimerda, but rather Jim’s own intimate reminiscences about the girl he grew up with, and their shared childhood experiences. Written in 1918, the novel offers a later perspective of an earlier time. 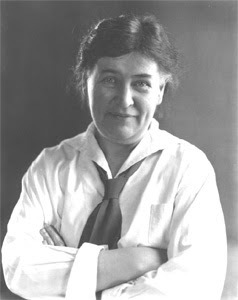 Cather had become deeply disillusioned in the horrific aftermath of the Great War, as well as with an increasingly mechanised and urbanised Republic. As a response, she mythologises America’s pre-industrialised past: the final chapter shows Jim and Ántonia looking at photographs from their youth, a tangible reference to this bygone era. Eschewing any real sense of plot, the anecdotal structure of My Ántonia produces a cumulative effect: the frequent allusions to formative events in Jim’s life, and the accompanying feelings of nostalgia produced by this, combine to set the novel’s wistful tone. One particular scene depicts Jim protecting himself and Ántonia from a snake by beating it away, a symbol of the inevitable loss of innocence experienced by growing up, as well, it is often suggested, as reflecting Cather’s personal rejection of heterosexual relations. Cather’s is a largely sympathetic portrait of these often challenging experiences, focusing on the Shimerdas, a Bohemian family who attempt to carve a new life from this raw ‘material’. Homesickness, communication problems and the vagaries of social hierarchy are all obstacles which block the path of the settlers during the novel. Yet as Miller continues, the fate of all characters, irrespective of personal circumstance, is ultimately subject to the inevitable cycle of nature: as the first section follows the often harsh impact of the shifting seasons upon the frontier, so the novel also presents a microcosm of the cultural development of society, beginning with the prairie experience in the west, and concluding with Jim’s enrollment at Harvard in the east. Yet when he revisits Ántonia at the end of the novel (and so completing the cycle), Cather privileges the enduring qualities of the frontier as the only appropriate image with which to conclude her story. In this ambiguous conclusion, however, Ántonia has abandoned English in favour of the Bohemian language of her ancestors as she speaks with her family; hers is a future tempered by the past, and My Ántonia is a novel saturated with memories of the “precious, the incommunicable past,” a past embodied in the compelling figure of Ántonia. If Obama gets to do an inaugration do-over, we can spend one more post on the inauguration. Above, you can see a snippet of the inauguration newspaper quilt put together on Going.com. Elsewhere, there's been some neat content analysis of Obama's inaugural address. ReadWriteWeb has used wordle to generate a wordcloud of the most commonly used words in Obama's speech - and compares it to those who went before. The New York Times does something similar, but presents the most commonly used words in each and every inauguration address in a handy interactive timeline. Much attention is being paid to Obama's use of sources in his inaugural speech - here's CNN, for example. It's certainly been noted that when Obama seemed to quote Washington, he was in fact quoting Thomas Paine. Above, you can see the quotation in question as it appeared in the first pamphlet of Thomas Paine's The American Crisis, published in December 1776 - more famous, perhaps, for its opening line: "These are the times that try men's souls." You can view an original copy of the Crisis at the Library of Congress. But why might this be of particular interest to us at the UEA? Because Thomas Paine was born just down the road in Norfolk - in Thetford, in 1737. Below you can see a picture of Thetford's statue of Thomas Paine; and you can read more about the remarkable life and career of one of Norfolk's most famous sons thanks to BBC Norfolk. President Obama has spoken, and the dissection has already begun. Here's the video (thanks, MSNBC) and the transcript of the inauguration speech in full (thanks, Huffington Post). Reactions? Leave us a comment. They will not be met easily or in a short span of time. But know this, America - they will be met. On this day, we gather because we have chosen hope over fear, unity of purpose over conflict and discord. We honor them not only because they are guardians of our liberty, but because they embody the spirit of service; a willingness to find meaning in something greater than themselves. And yet, at this moment - a moment that will define a generation - it is precisely this spirit that must inhabit us all. It's no surprise that the inauguration is producing mountains of digital comment. Where to start? The New York Times gives an account of Sunday's concert at the Lincoln Memorial - the event that kick-started the three-day inauguration celebrations - and Obama's activities yesterday, the Martin Luther King Day of Service. Thankfully, Slate gives you a breakdown of today's newspapers and their reactions to events. Slate has also been asking its readers to write their own inauguration speeches. Serious Eats lets you know what's on the menu at the inauguration luncheon - and gives you recipes to recreate the dishes at your own inauguration parties. But how to watch the inauguration? Close to home, you can watch it in the Blue Bar - coverage from 4pm-6pm. Online, CNN gives you some tips about live-streaming and live-blogging here. But as our own loyal commenters have already told us, CNN's own streaming site is probably the most interesting pick, particularly because of its mash-up with facebook. The swearing-in begins at 11.30 (16.30 UK time), and Obama will be sworn in at midday. Once it's embeddable, we'll put it all up here. Enjoy. And goodbye, George. 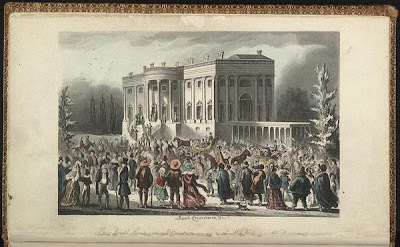 Ladies fainted, men were seen with bloody noses and such a scene of confusion took place as is impossible to describe, - those who got in could not get out by the door again, but had to scramble out of windows. Inauguration anticipation is building, and leeching into popular culture through a variety of avenues. Obama's on the cover of a special Inauguration Day edition of The Amazing Spiderman (via The Smoking Section), and it's already gone to a second printing. More interactively, Paste magazine is hosting the Obamicon.me, which allows you to turn any image into an Obama-style poster (see below). Meanwhile, Slate ponders how the Obamas will actually move into the White House, and the detailed answer is strangely compelling. The New York Times has an up-to-date list of the celebrities slated to perform at the "Neighbourhood Inaugural Ball", the first event that Obama will attend as President (confirmed: Mariah Carey, Mary J. Blige, Alicia Keys, Jay-Z, Beyonce and Stevie Wonder). It looks likely to be live-streamed, and we'll let you know where as soon as we find out. UPDATE: Here's Dr Malcolm Mclaughlin looking suitably Presidential. Feel free to share your own Obamicons with us in the comments. There are some writers who, whatever their initial reputation, drift from the public consciousness, the flame kept alive by readers and fellow writers who feel honour bound to introduce friends into what can quickly risk becoming a priesthood of the initiates. Richard Yates was one such. His first book, Revolutionary Road, appeared in 1961 and was nominated for the National Book Award. Later in the 60s, recommended by William Styron, he became speech writer to Robert Kennedy, a distraction, he realised, and a disillusionment. In a last novel, never finished, he would lament the dishonesty of public life even as, at the time, he had been dismayed at the loss of a man who he had felt could change America. There were other books, including the impressive The Easter Parade (1976), but print runs were usually abbreviated. Magazines showed little interest in his short stories. His work went out of print, was resurrected, faded away. He suffered from depression, smoked, and fuelled himself with more alcohol than was good for him. When he died, in 1992, he was reduced to carrying a portable oxygen tank because of lungs ruined by TB and emphysema. There were writers for whom such a history would have been a principle recommendation, providing a satisfying myth in which life was traded for art. It never quite worked that way for Yates. By the time of his death he was largely forgotten. But not by everyone. Kurt Vonnegut was an admirer while Richard Ford declared a debt to him. In this country David Hare waved a banner. Nor were they alone. Today, he is back in print, and now Sam Mendes has made a film version of that first, great novel. Good writers never really fade away. They just wait for people to come to their senses. New readers should start where his first readers started, with Revolutionary Road, though prepare to have the air sucked out of your own lungs because the world he describes there – suburban America as the 1950s edged into the 1960s – is hermetic. Yates acknowledged it to be his best book, itself, of course, tinder for a depressive. He lost out to Walker Percy who won The National Book Award for The Moviegoer, but in the end it is not prizes that are the mark of a book, though I suspect he would have liked one. Revolutionary Road is set in suburban New England, in one of those modern developments which never quite assure those who live there that they have arrived at whatever destination they imagined themselves to aspire to. The central characters are the Wheelers, moving grudgingly into their thirties, aware at some level that they have failed while unable to identify the precise nature of that failure. Frank thinks of himself as a ‘kind of Jean-Paul Sartre sort of man,’ as well he might as beneath him is an existential void. He has enough awareness to be conscious of inadequacy but not enough to understand his responsibility for it. His wife sees herself as a support operation until, suddenly, she does not and their world begins its slow collapse. There are hints of Sinclair Lewis here, as there is of the Ernest Hemingway of the short stories (Yates uses the word ‘brilliantly’ as only Hemingway had done to convey a sense of an inappropriate emotional response). These, though, are no more than nods of acknowledgement. The world Yates creates is his own. He draws a portrait of a society which lacks transcendence, lacks even an awareness of what that might be. His are characters who perform their lives but they are no better at doing so than April Wheeler is when she appears in the amateur dramatics which open the book. Both of them hazard an affair, though without passion which is altogether too positive a feeling. They are adrift. They have children but make no real connection with them, shipping them off to acquaintances so that they can indulge themselves in the rows which are a substitute for contact. A neighbour’s adult schizophrenic son is one of the only characters to names things as they are, to ignore the curious decorum which passes for sociability, and he is incarcerated for his pains. They are aware that they are trapped, that the grace of their bodies is beginning to fade, that their ambitions have been compromised and their visions dulled. They are not so much living their lives as waiting them out until April takes it into her mind to kill her child in the womb, though whether that is a gesture towards freedom of a sorts or some final act of capitulation is not clear, especially, it seems, to her. The book ends as a character turns off his hearing aid, choosing silence over the vapid chatter which passes for communication in Revolutionary Road. And if the rest is not silence then it is no more than a suspiration, a prolonged sigh over an America which seems to have lost any sense of purpose or direction. As Yates himself explained, the title was intended to invoke the revolutionary spirit of 1776, the best, brave spirit of change and possibility now come to a dead end in 50s America. Well, that is nearly half a century ago. So does Yates’s novel offer anything more than a footnote to an American complacency and conformity that has surely long since disappeared? You will detect a rhetorical question when you read one. Nearly a decade deep into the 21st century, with capitalism in freefall and no one confidently stepping forward to explain what has gone wrong or how we might proceed, that same lack of direction, that same absence of transcendence, that same sense of an obdurate failure mocks us all. Yates was something more than a poèt maudit. He was a moral surgeon dissecting the world we still inhabit. We waited until the second post of the year to mention the "O" word, but it doesn't look like Obama-mania is going anywhere fast. 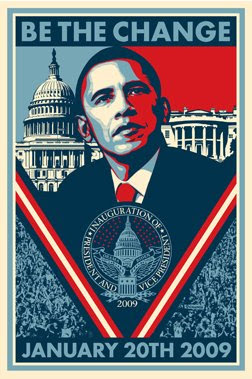 Above, you can see his official inauguration poster (as reported by the Huffington Post) which goes on sale tomorrow. Get it while you can. Inauguration buzz is widespread and only set to grow: Wired gives details of the presidential limosuine (5 inch windows, no less) whilst GoogleWatch reports on Google / Youtube's plans for an inauguration party. More crucial updates as they emerge. 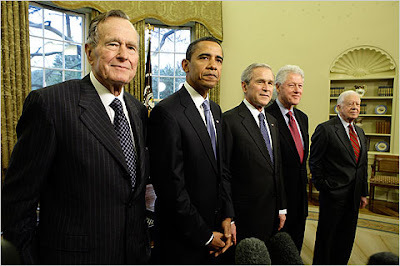 Elsewhere, the New York Times political blog The Caucus reports on yesterday's living presidents meeting (see below), whilst others (here, the BBC) spend a final few moments mocking the out-going president. But what if the old media dies much more quickly? What if a hurricane comes along and obliterates the dunes entirely? Specifically, what if The New York Times goes out of business—like, this May? It’s certainly plausible. As a purely demographic matter, then, the “white America” that Lothrop Stoddard believed in so fervently may cease to exist in 2040, 2050, or 2060, or later still. But where the culture is concerned, it’s already all but finished. Instead of the long-standing model of assimilation toward a common center, the culture is being remade in the image of white America’s multiethnic, multicolored heirs. Enjoy - and let us know what you think.